Being considered as one of the healthiest fruits, papaya helps in curing many diseases. Not only the pulp but its leaves contain many healing properties. Its leaves are well-known to increase the platelet count and are also enriched with anti-malarial properties, making it the best home remedy to fight against dengue fever and other illnesses. Papaya leaves contain phenolic compounds, papain and alkaloids and these nutrients act as strong antioxidants which, in turn, enhance the body’s immunity. Also, the combination of papain and another compound helps in effectively digesting the essential proteins which can cure digestive disorders. Many health experts suggest papaya leaf juice as an effective remedy to treat dengue fever. This deadly disease is caused by Aedes mosquitoes. They transmit the disease into our blood and cause high fever, skin rash and decrease in platelet count. 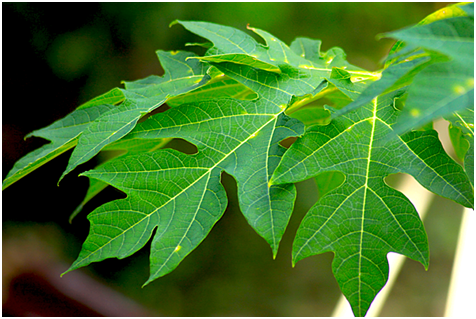 The extract from papaya leaf helps in reducing the symptoms of dengue. Papaya leaves also have strong anti-malarial properties, making them best to cure dengue fever. Acetogenin, a compound found in papaya leaf helps in preventing disease like malaria and dengue. The juice or pulp made from papaya plant is quite effective not only in fighting the symptoms of dengue fever but also in curing it. Here are some ways you can use papaya leaves to cure dengue fever. Method 1. Partly dry some medium-sized papaya leaves after thoroughly washing them. Cut them into small pieces. Place the leaves in a saucepan with 2 litres of water. Bring the water and leaves to boil and then simmer. Do not cover the saucepan until the water is reduced by half, strain the liquid. Fill this extract in glass containers. Method 2. Another way is to eat ripe papaya daily. Also, you can drink a glass of papaya juice by adding a little lemon juice. Drink this juice for at least 2-3 times a day and you can cure dengue fever faster. Method 3. Take some papaya leaves and crush them. Once you get the juice from the extract, drink 2 tablespoons of this bitter juice 2 times a day.